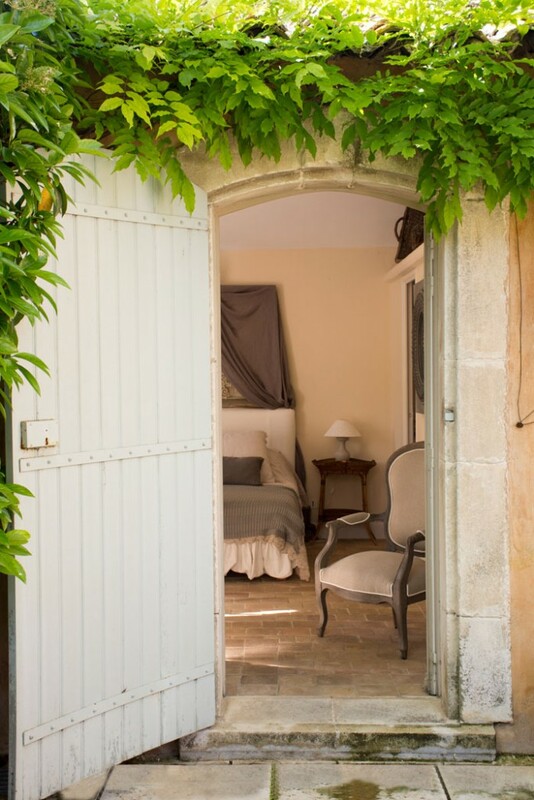 A 17th-century home in France provides a picturesque and relaxing getaway for European vacationers. The farmhouse kitchen has an open fireplace the homeowners use for cooking and a grill you pop on the coals. Antique accents, such as the 19th-century scales, marble mortar and pestle and 19th-century birdcage give the space an Old World feel. 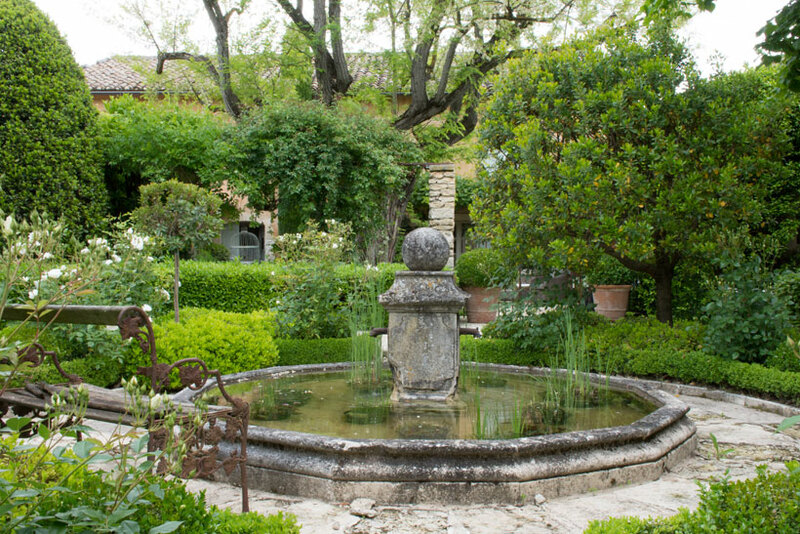 Tranquil fountains, luscious gardens and preserved historical features make this 17th-century home in Luberon Valley, France, the go-to destination for a French country retreat. As the homeowners Sioned Rees-Thomas and her partner, Gavin, purchased the home in 2007 mainly for a holiday getaway, they’ve chosen to rent it out during the spring, summer and autumn. 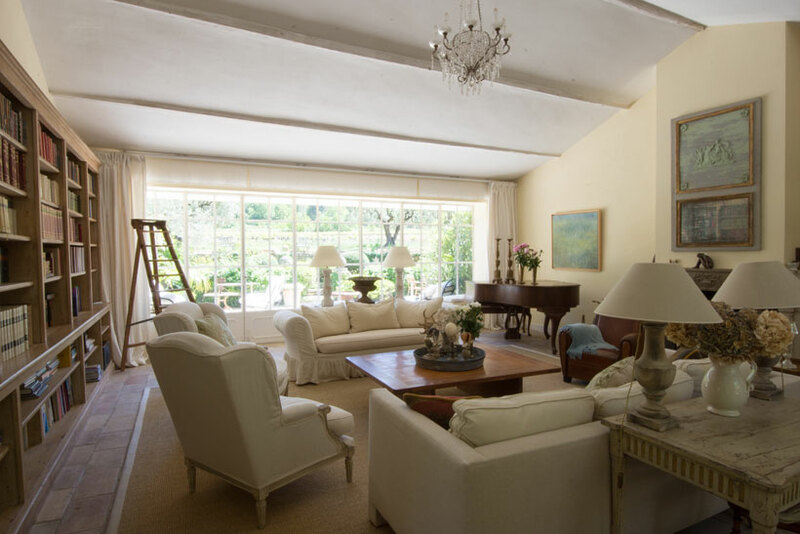 To provide the perfect atmosphere for themselves and future renters, Sioned and Gavin hired Susannah Cameron, director of Chez Pluie Provence, to update the style of the home while maintaining its historic roots. A tranquil experience awaits those who rent out this home, and the fountains are one of the first features to put you at ease as you walk through the gate. 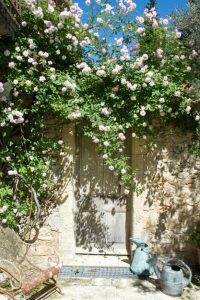 Climbing vines and dreamy plant life cover the exterior of the home, drawing attention to the rendered stone walls and charming doorways. 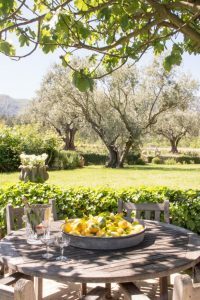 One of several outdoor dining areas, this serene location allows guests to enjoy the fig and olive trees and catch a glimpse of the Luberon mountains while relaxing in the shade. Having no television in the music salon makes the space ideal for reading, talking and, of course, listening to music by the fire. A built-in bookcase spans an entire wall of the room, providing the homeowners and guests with endless literary options. “The homeowners are always on the hunt for old books,” says Susannah. The home had been renovated before the homeowners moved in, making only interior design changes necessary. “I helped them push the boundaries a bit with accents from the midcentury up to the 1980s,” says Susannah. Her company provides interior design services, but they’re also an online store that specializes in French antiques and vintage homeware, so she incorporated some pieces from her shop into the home. “I switched out some of their Asian influences and replaced them with something softer, such as the Karibou painting over the music salon piano,” says Susannah. 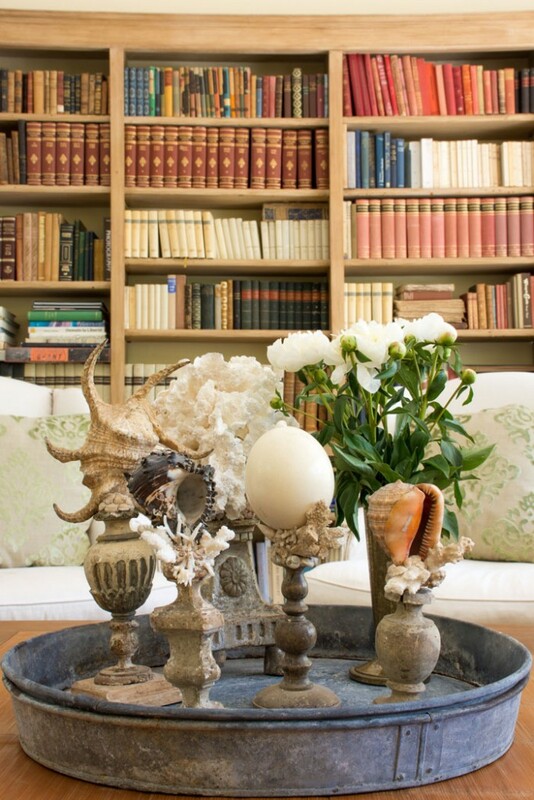 Seashells mounted on salvaged pieces grace the music salon in a rustic zinc tray. One of the salvaged pieces even carries an ostrich egg. 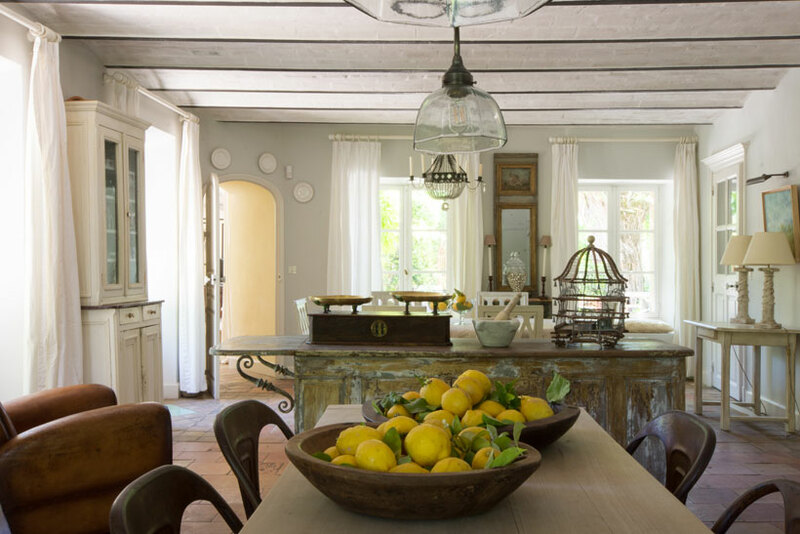 Though they updated the décor of the home, a lot of the original features remain untouched, such as the dining room ceiling beams, the staircase and the original summer kitchen. If something was added or changed, it was made to fit the centuries-old vibe, like the red terra cotta tiles in the dining room and the built-in shelves in the music salon. This practice allowed them to make functional updates without altering the overall feel of the historic home. When good weather prevails, the homeowners use this summer kitchen to take full advantage of the sun. The cover provides shade while allowing visitors to enjoy the views. 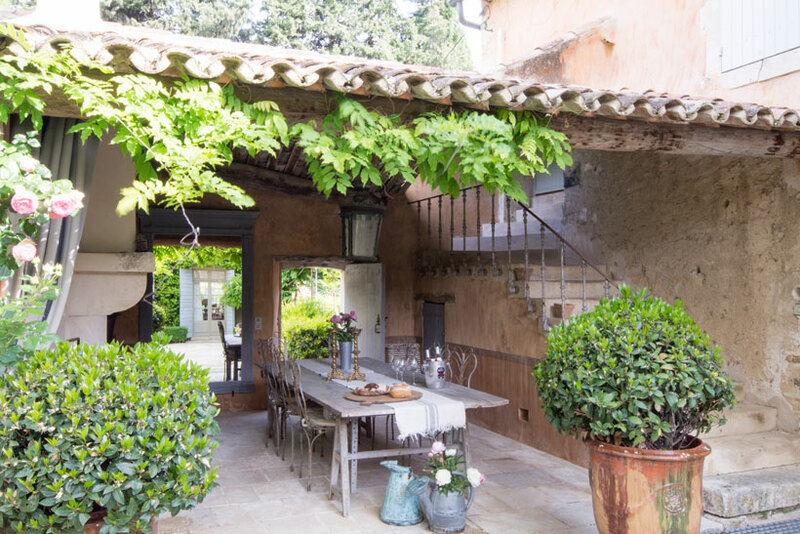 “This is the original summer kitchen,” says Susannah. A farm trestle table and antique butterfly-back chairs continue the simple décor style and complement the original look and feel of the period home. Even if you live in the middle of a crowded city, this relaxed, country look can be emulated with a bit of creativity. “Start with some entry-level antiques,” says Susannah. “You don’t need a huge budget to enjoy something old and precious.” Try using things in a different context, such as garden pots indoors or a watering can as a vase. This will bring the feel of the country to your home whatever your location. A testament to the 17th-century home, the dining room boasts original wood beams on the ceiling and red terra cotta tiles that were typical for that time period. 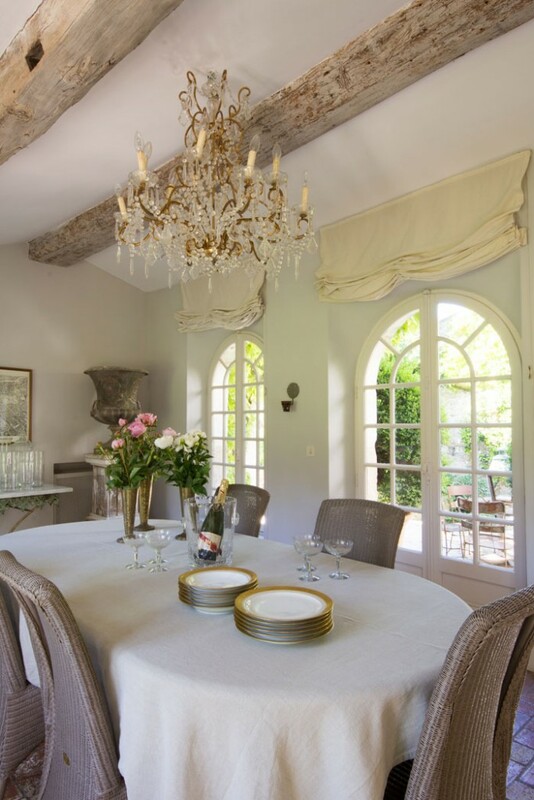 A gilded-frame antique chandelier brings elegance to the space, while garden chairs surrounding the table give the room a relaxed vibe.